Glen Grant owned a bookstore and coffee shop called the Haunt on South King Street near Puck's Alley. He considered it a home for "the creative and offbeat." Glen Grant used to tell a tale of how his home district of Moiliili got its name. The original place name was Kamo'ili'ili, or pebble lizard, named after the mo'o that attacked the sister of Pele, Hi'iaka, while she was returning to the Big Island with her friend Wahineomao and Lohiau, the handsome young chief of Kauai. Hi'iaka smote the fierce, supernatural reptile with forks of lightning she concealed under her skirt. His body was then cut to pieces, where they turned into a low hill in the neighborhood of an old church that would be named Kamo'ili'ili, on a parcel of land now occupied by Kuhio Elementary School. Rebecca Ryan, executive director of Moiliili Community Center, thinks her fellow board member is now "talking to Pele and Hi'iaka about the story of Moiliili, definitely on some higher level." Grant died early yesterday at Kaiser Permanente's Moanalua Medical Center. The cancer that started in his prostate was thought to be in remission but instead had metastasized throughout his body. His friends and family didn't know how much time he had left, but as late as Wednesday they were praying that there would be time for him to be placed in a hospice. "There was so much more that Glen had to share," said friend and Cane Haul Road owner Grant Kagimoto. "He is irreplaceable. He reached a broad audience with his ghost and detective stories. His tastes were so catholic that they included Hawaiian history." GRANT was best known as an expansive storyteller of local supernatural lore -- in print, with his popular obake and chicken skin tales, in person during tours of haunted Oahu locales, and on radio. But Grant was also an avid Hawaiiana historian, a small-businessman and active community member of the Moiliili he so loved. Ryan said he had just been elected to the center's board in January. Grant, business partner Jill Staas and friends ran the popular "Honolulu Timewalks" and "Ghostbusters" walking tours from offices in the century-old Kamada Building near the corner of University Avenue and South King Street, next door to their bookshop-coffee bar the Haunt. It was a gathering place for what he called "the creative and offbeat," playing old radio dramas and grade-B horror movies and providing space for the occasional small concert or poetry reading. The Haunt opened in November 2000. In September an upstairs office was renovated into a ghostly seance room in an early Americana style, circa 1868. Grant was once asked if he ever was concerned about the possible bachi attached to dabbling so much in the supernatural. "Always," he said. 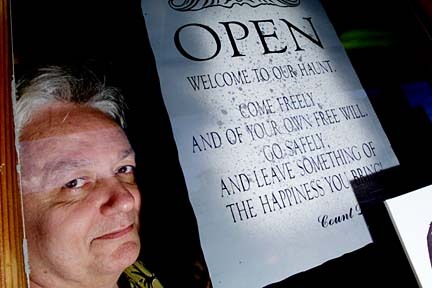 When he started collecting his chilling tales more than 20 years ago, Grant said a Hawaiian woman asked about his intentions: "She said, 'If you ever do this for a bad reason, you'll bring (the stories) back to you, and you'll suffer.' And I said, 'What's a bad intention?' and she said, 'You decide.' And that has always been on my shoulder." But he told his stories with the best of intentions, always with a glint in his eye, a wry smile and as much dramatic flourish as he could muster. THEN THERE was Grant's work in the halls of higher learning. Grant was a professor of American studies, history and political science at the University of Hawaii at Manoa, Kapiolani Community College and Tokai International University (he was vice chancellor at Tokai at the time of his death). In 1979 he won the prestigious Board of Regents Medal for Teaching Excellence for his work at UH. He developed and coordinated a statewide "Interpret Hawai'i" program to train visitor-industry personnel in the history and culture of the islands while he was working in the Office of Community Services at KCC. Grant grew up near Culver City, Calif., and earned a bachelor's degree in history at the University of California at Los Angeles in 1968. He visited the islands the following year at the behest of his longtime friend, Dennis Ogawa, now graduate chairman of the UH American Studies Department. Grant made the permanent move to Hawaii in 1971 and as a graduate assistant became a popular instructor, interspersing his lectures with "chicken skin" tales and costumed characterizations of historical characters. Through his students and their families, Grant immersed himself in the history and folklore of the people of Hawaii for the next three decades. "He was a very creative man and a raconteur," she said. "He had a deep feeling for the islands and the community, Moiliili in particular. It's a great loss to the community." When the festival comes around again on Sept. 27, Ryan said it will be held in memory of Grant. A memorial service is being planned, and, in lieu of flowers, Grant's family is requesting that donations be made to the UHF -- Glen Grant Memorial Fund, University of Hawaii Foundation, P.O. Box 11270, Honolulu 96828. Donations will be used to perpetuate his commitment to education. Arnold Hiura, a freelance writer, member of Moiliili Blind Fish Tank Media and a friend and former business partner of Glen Grant, contributed to this report.